← The Discovery Place does optics! One of my goals in blogging has been to run a series of posts covering the “basics” of optics, namely those concepts that form the basis of an understanding of the more advanced topics investigated by researchers today. 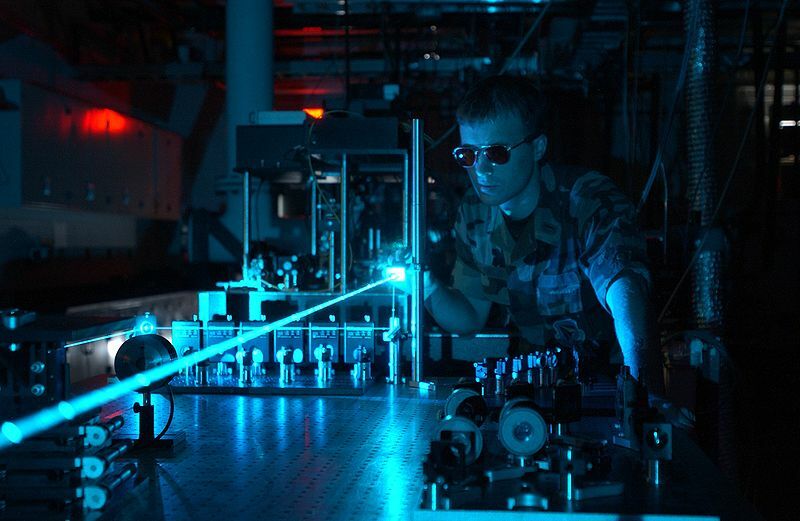 Though I’ve done a pretty good job so far, I recently realized that I’ve left out a discussion of the most important tool of the optical scientist, and one of the most important technological advances of the modern era: the laser! Image via Wikipedia, of an experiment at the Air Force Research Lab. “Laser” is an acronym for “Light Amplification by Stimulated Emission of Radiation”, and it refers to a device that produces light by an unusual physical process not typically found in nature. 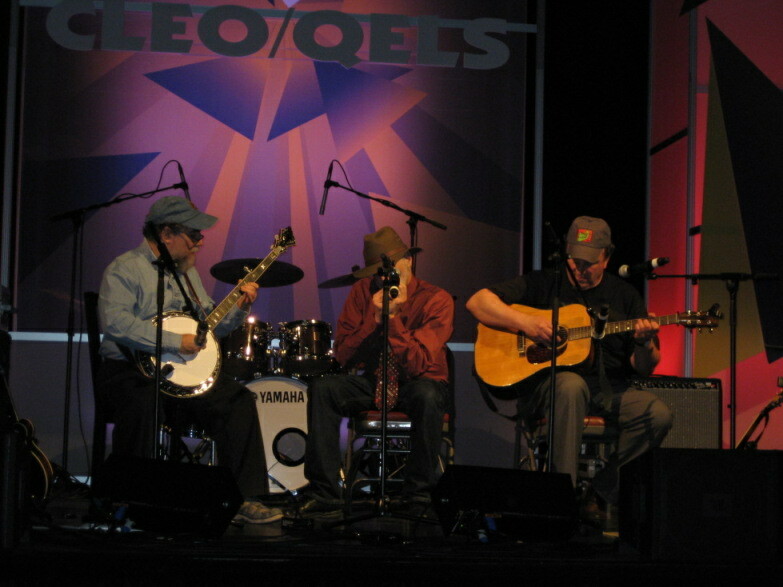 Musical group “Second and Third Harmonic Generation” playing at Lasers Rock! Picture via Ksenia’s CLEO/QELS blog. I hardly need to describe the impact lasers have had on our society, and it is hardly possible to list all of the applications! Among other things, lasers are used to read CDs, DVDs and Blu-ray discs, they form the basis of the fiber-optic communications systems by which you are probably reading this post, they are used in medicine both to diagnose problems as well as to perform laser surgery, they are used to cut material in industrial fabrication. Their properties make them ideal for doing optics research of all sorts, and they are now an essential tool for researchers. First, I will discuss what a laser is, and what properties a laser has that distinguishes it from “ordinary” light sources like light bulbs. Second, I will describe the fundamental physics behind the lasing effect, in particular the process of stimulated emission. Finally, I will explain the engineering that is used to take advantage of stimulated emission and make a laser. Directionality. An ordinary light source, like a light bulb, radiates light in all directions. The light emitted by a laser all travels essentially in a single direction. Diffraction effects eventually cause the laser beam to spread, but it can travel great distances before that happens. The directionality of a laser makes them ideal as an optical (laser) pointer: a small, bright spot of light can be shined across a room without a loss of intensity. Monochromaticity. Ordinary light sources tend to emit light over a broad range of frequencies (colors). Lasers tend to produce light that is highly monochromatic (single color). Spatial coherence. As has been discussed in a previous “basics” post, spatial coherence is the ability of a wavefield at two different points in space to create interference patterns. 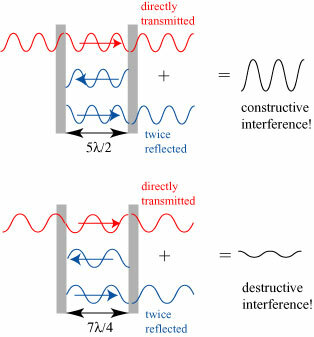 Light from an ordinary light source and the Sun is highly incoherent: it is not possible to directly use light from such sources in an interference experiment like Young’s double slit experiment. Lasers tend to produce light that is spatially fully coherent — it can produce highly visible interference patterns. Brightness. One measure of the “strength” of a light beam is the rate at which it delivers energy to a target. A more refined measure of the light beam strength is the power per direction of propagation. Because a laser delivers all of its light in essentially a single direction, it has a very high brightness, typically orders of magnitude higher than any conventional light source. The brightness of even a weak laser pointer makes its beam dangerous to the naked eye; pointing the beam in your eye is essentially dumping all of the energy of the laser beam into a very small region of one’s eye. we would also need to filter the sunlight passing through the collimating screen, which would attenuate the amount of light available for our experiment ever further. With a laser, however, we would already have filtered, coherent, directional light, and will be able to see a very bright interference pattern. If we want to demonstrate wave optics effects or apply them to a problem, a laser is a far, far better source of light than any conventional source. The physics of the laser. So what is the origin of this unusual source of light? To understand it, we need to understand a little about atoms and how they absorb/emit light. One of the most important early results of the era of quantum mechanics was the 1913 Bohr model of the atom and its implications for light/matter interactions. By that time, it had been known for a century that atoms emit/absorb light only at very distinct, characteristic frequencies. Researchers of the late 1800s/early 1900s bent over backwards trying to explain this observation using known physics, but the real explanation required a leap into the new and inexplicable. 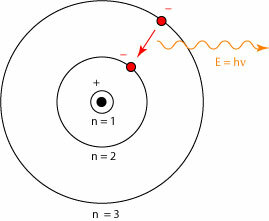 Bohr hypothesized that the electron of a hydrogen atom can only orbit the nucleus with special discrete values of angular momentum, which is equivalent to saying that the electron can only orbit at certain discrete orbital distances and possess certain discrete energies, which are labeled by a principal quantum number . Part of this model is the suggestion that an atom can only absorb/release energy into light “all at once”, in the form of a light particle (photon). When the electron goes from a higher energy state to a lower energy state , the energy of the photon is simply equal to the energy released: . Einstein had already postulated that the energy of a photon is related to the frequency $latex\nu$ of its oscillation, which means that the frequency of the released photon is given by , where is Planck’s constant. Using this model, Bohr was able to explain the observed discrete energy levels of the hydrogen atom, and initiated the quantum theory of matter. 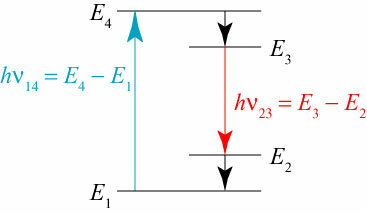 The horizontal lines represent the energy levels of hydrogen, while the vertical arrows represent the transition of the electron from a higher energy state to a lower energy state with the release of a photon. 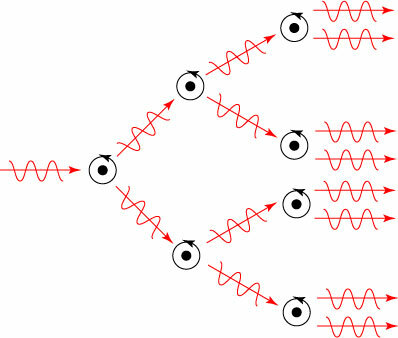 The process of the absorption of light works in reverse — the absorption of a photon of wavelength 121.57 nm, for instance, will coincide with a transition of the atom from the to level of the atom. The state is known as the ground state of the atom; it is the lowest energy state that the electron, and hence the atom, can be in. We can draw energy level diagrams for other atoms and molecules that are of a similar nature — albeit much, much more complicated. The ordinary process of atomic emission is known as spontaneous emission: an atom in an excited state will, eventually, spontaneously emit a photon and drop to a lower energy state. We have also noted that an atom can also absorb a photon of the proper frequency, raising the atom to a higher energy state. Ordinary light sources are, in essence, a collection of atoms that are excited thermally or electrically and radiate via spontaneous emission. Because the atoms are radiating independently, the light goes in all directions and has a low spatial coherence. This is the basic physics behind the operation of the laser — if we have enough atoms in the excited state, we can generate a massive flood of photons all traveling in the same direction and otherwise behaving identically! There is an important catch to this, however — how do we get a bunch of atoms in the excited state to begin with? In order for an “avalanche” to be triggered, there have to be more atoms in the excited state than in the ground state, a situation known as population inversion (the “population” of atoms must be mostly in the excited state, “inverted”). Imagine that we try to create a population inversion by starting with a bunch of atoms in the ground state and excite them with a beam of light of the appropriate frequency. At first, most photons will be absorbed by the atoms and transition to their excited state; however, as more and more atoms get excited, it becomes more and more likely that a photon will instead “kick” an atom back into the ground state. Roughly speaking, when 50% of the atoms have been excited, a photon is just as likely to knock an atom back into the ground state as it is to pump an atom into the excited state. It would seem, using this simple strategy, that it is impossible to get more atoms in the excited state than exist in the ground state. We further suppose that such a 3-level atom that is excited to level 3 very quickly decays to level 2, but the atom takes a relatively long time to decay back to the ground state, level 1. If we excite a collection of these atoms to level 3 using a light beam at frequency , they will drop to level 2 too fast to be de-excited by the light beam! Any atoms still in level 1 can then be also excited to level 3, and so on. By this process, we end up with most of the atoms continually in level 2, and almost no atoms in level 1: we have achieved population inversion! We imagine that the atom transitions very quickly from level 4 to level 3, and also from level 2 to level 1. If we are interested in achieving population inversion between levels 2 and 3, we note that such atoms will almost never be in level 2, because it decays so fast — we effectively achieve population inversion once we get any atoms into level 3! Clearly, not just any 3 or 4 levels of an atom will work — only certain energy levels of certain materials possess the right energy level structure to make population inversion. However, there has been enough research done through the years that an amazing variety of materials have been used as the basis of a laser: solids, liquids and gases alike. The components of a laser. A laser is more than stimulated emission — a number of components are required to make a laser beam with all the desirable characteristics we introduced above. 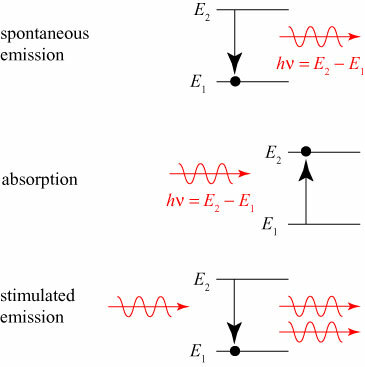 In fact, the “avalanche” of photons we described above is a distinct phenomenon with its own name, amplified spontaneous emission: an initial photon created by spontaneous emission produces many more photons by inducing stimulated emission in excited atoms. gain medium. The gain medium is the lasing material, to be population inverted, typically a 3-level or 4-level atom. The properties of the laser light such as wavelength depend on the choice of medium. 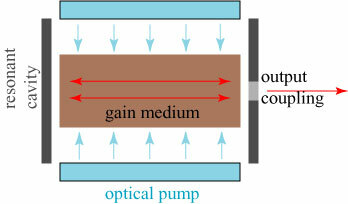 optical pump. We need some technique to excite the gain medium into an inverted state. The most obvious technique to do this is to use an optical pump (like a flashbulb) that produces light that can excite the gain medium to the 3rd (or 4th) level. It is also possible to excite the gain medium by electrical means, and even to use another laser as a pump. resonant cavity. We discuss the cavity in more detail below. The simplest cavity imaginable consists of two parallel mirrors that bounce the stimulated photons back and forth through the gain medium. 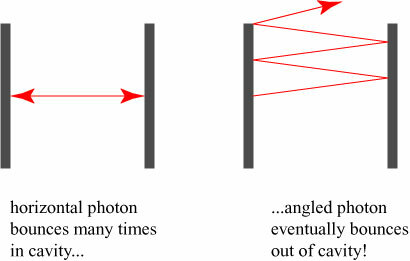 On each pass through the cavity, a single photon may excite a large number of additional photons through stimulated emission. The cavity, therefore, gives each photon a large number of opportunities to excite additional photons, enhancing the “avalanche” effect. output coupling. Once we get all these photons bouncing around in the cavity, we need to get them out somehow! 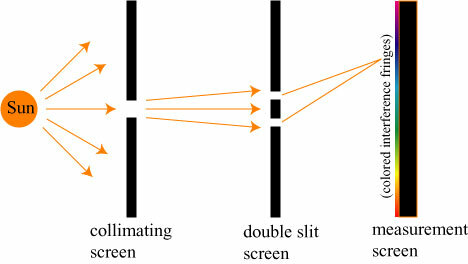 Typically one of the mirrors is partially reflecting, so that some small, small fraction of photons incident upon the mirror actually pass through it and become the output beam. The result is that the perpendicularly-traveling photons get the most amplification, and the light beam that comes out of the laser cavity consists primarily of these single-direction photons! Because the cavity restricts the output light to lie within certain very narrow frequency ranges, the output is very monochromatic. These are the components that make up a “standard” laser. It is to be noted, however, that scientists and engineers have changed any and all of them to produce a variety of different effects. A discussion of these changes, and their effects, takes us well outside of the “basics” level of this post! ¹ The idea of the laser was sufficiently “out there”, in fact, that the idea met with a lot of resistance! I heard a talk by Charles Townes, the visionary who conceived of the idea of the LASER and its microwave analogue, the MASER, a few years ago. Townes described how he discussed his idea with many of the geniuses of his time, and was told by most of them, “It can’t work!” (Some of them later came back to him and said, “Hey, you might be right.”) Also, the paper describing the first operating LASER, by Theodore Maiman, was actually rejected by Physical Review Letters! This entry was posted in Optics, Optics basics. Bookmark the permalink. 9 Responses to Optics basics: lasers! Stimulated emission – tee hee! (ok, couldn’t help the 4th grade joke). Keep the basic posts coming, this is great! But . . . How do you attach them to the sharks? Thanks for posting this in such a way that a 55 year old w/a degree in history could understand it. Maybe you just have to ask the right way. Determining the optimal placement of a series of coherent light sources emitting light of in-step waves of identical frequency, phase, and polarization in the range of 100–3000 W (peak output 1.5 kW) on a viable member of the species of Carcharodon carcharias. Said placement to include a moisture impervious energy source, housing for the light emitting sources and programmable control module. How does it happen that sunlight is coherent over a small area? From what you describe the obvious choice is somehow you get stimulated emission. Could there be some other reason? How could the stimulated emission work? Are, say, incandescent light bulbs coherent over small areas? I think you’ve seen my post on coherence now; the increase in spatial coherence is, in essence, a geometric effect. Point sources are coherent, and though a large thermal source isn’t, it “looks” like a point source when you get far enough away. In principle, light bulbs are also coherent over a small area; however, it is a *very* small area. Thank you, that’s what I’m trying to imagine. Light from a single atom should be coherent, if it means anything to talk about coherence in that case. Perhaps light from a single atom starts stimulated emission to get more light total? It should be possible to estimate how much of the sun is involved in the experiment. Figure out what distance on the screen is relevant. Maybe a centimeter 3 meters distant from the slit or pinhole? Then the corresponding distance from the center position on the sun would be 1/300 times 150 million km? No, I only included the distance from the second slit to the screen. I need the distance from the first pinhole to the screen. Still, it seems like it could be a pretty big area for stimulated emission to operate over, right?